The newest release is coming out of the close BAR25 family circle. What a pleasure ! 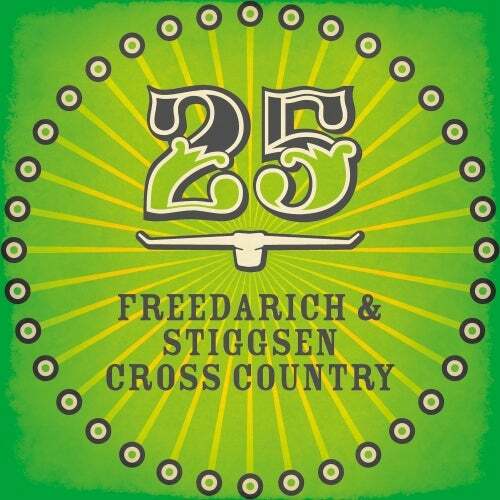 "Cross Country" that Stiggsen has been recorded with her longtime music mate Freedarich is nothing less than an invention of a new genre called "Stoner-Electro-Country" with short trips into polka. Stoned vultures tracking their circles in the sky, cowboys are dancing in glittering lights and surf guitars playing against the dry beat. at the same time it's not cheesy but rather opens new unbelievable dimensions. The remix from Lexy doesn't take the fancy effect of the track and gives them the typical Lexy-Turn. It's a bit like if a sound-spaceship lands in the dessert and invites to a cactus dance. A DREAM !